Full view available via Download. Illustrating the inside of the Lavos shell was fun. Just made it up as I went along, mixing organic and inorganic elements together. Take a look at that link and let me know which one you think would be coolest. 2nd form is the giant one with tubes connected to it; Lavos core is the one with all the different sprites on the bottom right. Whenever I finish the second half, I'll post it on its own too, as well as a final composite of both parts together, forming one panoramic piece. Ought to look pretty sweet! Marvelous work! I especially like Crono's sword, and Marle's body mechanics and outfit. This one pops right off the page! Simply Amazing! Yeah man! You nailed it. Duuuuuuuuuude..... *checks pants* yup, i need new pants. 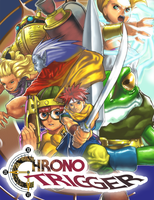 I like how you drew Crono, Frog and Marle in your own style. It's nice to see them like this, plus your style is very sweet, especially the colouring. Great job ! Say, I see you're aware of Chrono Compendium. Benevolence-9 group was hoping to set up a printable bookmarks/cards event this Christmas at the Compendium where fans would collaborate making custom bookmarks or getting permission from artists. I'd be honored to feature your artwork as a bookmark/card with your permit -- of course, you will be credited! loved this game, frog was my favorite to play. Hey, that's my party for the final Lavos battle!!! I really like the detail!!! Great job!!! I love the game so much!!! I died so many times against Lavos Core that I decided to leave and go level up and finish side quests. Now Crono, Marle, and Frog are all about Level 50, so I'll try again soon. Good luck!!! hehe! I ended up beating the game again the other day. CroMaFro were all in the low 50s. Started a New Game+ right after that and accidentally sent Crono through the right-side telepod at the festival. So five minutes after beating the game I'm fighting Lavos again. Good job. That sounds really fun. Maybe I shall have to give it a try...once I'm done. Nice job of putting their final weapons. This is an awesome image: great dynamic perspective, expressive characters, good coloring. Fantastic! Thanks very much! Glad you enjoy it! Rockin' yeah! My personal favorite game. Ever. I looked forward to see this part finished, awesome! Hopefully I'll have time to get to it in the next month or so, while I've still got conventions to go to! Wow, this is really cool! All the detail in the background and their outfits is great, and like someone said I like the "rainbow" effect on Crono's sword. Great work! yeee love this game love this depiction. Thanks! In a couple months I'd like to get around to doing part 2! Wonderfully realistic portrayal of the Chrono Trigger group. Both Crono and Frog seem more intent on killing the blasted Lavos than Marle is who seems to be more concerned with keeping everybody alive. While the second form may be easily more awesome looking, I would still go for the third form as the final. It has more potential for awesomeness, even it is harder. Background effects and such. lol I soloed all 3 stages of Lavos with Chrono and that sword. The good ol'days, the good ol' days, why must you stay so far behind? Chrono, Frog, and Marle, two water and one lightning character. My old team was Chrono, Robo, and Magus...pump Robo's magic rating up with Magic Tabs, and he was a decent healer IMO. Magus ark Matter FTW! Anyways, awesome work! I really enjoyed this, if you couldn't tell. This looks so gorgeous and realistic! Love how you made Crono's sword the Rainbow! XD I vote for the Lavos Core!